This is really 26. — Essie Marie. 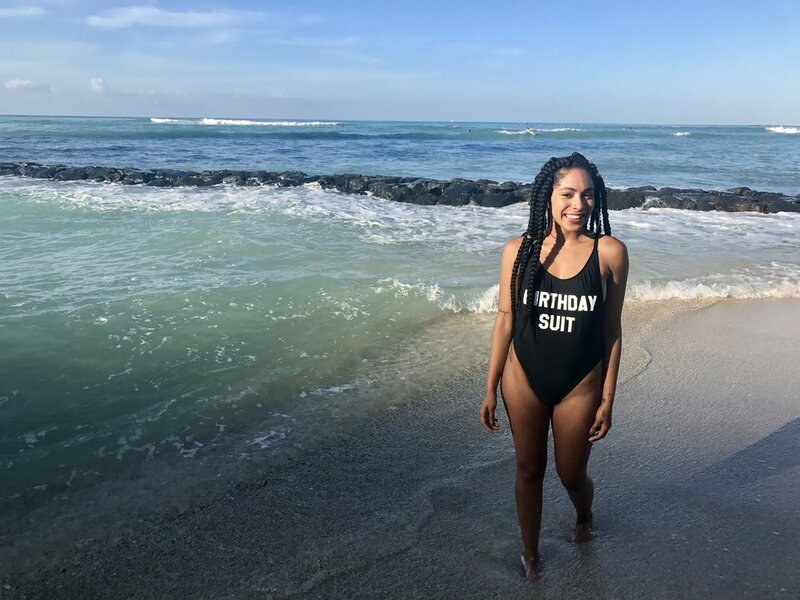 While I wish that being 26 was me just lounging around on a Hawaiian beach in my “birthday suit” all day, or eating shaved ice every chance I get, it’s not. It’s so much more than that, or less, depending on how you look at it. . Being 26 is waking up every single day being in charge of your own life, thankfully, with the help of Christ. But nevertheless, being accountable for your own actions. At 26, you can't blame your sister for your messy bedroom, like you could blame her for your messy playroom 18 years ago. At 26 there's no one to tell you "we've got food at the house", because your hubby is right next to you, egging you on, so you buy that "4 for $4 " meal from Wendy's and then regret it every step you take to the bathroom. At 26 you are responsible for your successes and your failures. Your regrets are yours and no one else's. And while you still hopefully have a support system, they can't fix your problems like they could when you were a kid. They can only support the weight you carry, they cannot take it off your shoulders. When I was a child I had this idea of what being "grown up" was going to be like, but it wasn't like this. At 5 I couldn't wait to be a grown up because then I could do whatever I wanted, AKA whatever my Mom said I couldn't do at the time. When in reality the only thing I do now, that I couldn't do back then, is stand next to the microwave. I am always impatiently waiting for my food to finish reheating. Which, now that I write this, I realize I should probably work on that because well, radiation wasn't good at 5, so it's probably not good at 26. As a child being a grown up was so glamourous. I was going to be a kindergarten teacher, and really rich, at the same time. At 5, I thought that I was going to birth 5 kids and live happily ever after. At 26 I am the mom to a spoiled 2 year old tortoise, and a wife to a loving, and also spoiled, husband, but about 5 kids short of my childhood dream. But I am exactly where God wants me to be. 26 is having the world see you as an adult, but not always feeling like an adult or even wanting to be one. It’s like going to the dentist and having the receptionist ask you if you want to “replace” your mom with your husband as your first emergency contact. After I bounced back from one of those most disrespectful questions I've ever been asked, I quietly responded with, "Wait, replace? Or add? And can there be like two number 1’s"? In my head thinking, So if I faint can you call my husband and then 3 way call my Mom? I feel like that’s fair, don’t you? 26 is feeling like you're too dependent upon your mom, but only because society says you shouldn't be anymore, because you are an "adult". But really being an adult is when you say, "F you society, I'm telling Mom you said that!" and go about your life because you know your place in life. I am exactly where God wants me to be. 26 is not having it all together, but having it together enough. And trusting the process. Drake was 25 sittin' on 25 mil, and I'm more like 26, sittin on... 26 bills? But again, trust the process. It's about being grateful, being humble and being honest with yourself. It's not about looking at other's and comparing your life to theirs. For me, it's about being content whether I am in Honolulu, or in Portland, or in the trenches fighting for my sanity. I am 26, and I owning it. I am exactly where God wants me to be.